Attacking the past for failing to live up to our contemporary notions of virtue. How much should we hold onto the past? How much should we try to forget the past? And how much should we try to make those pasts that we’re not happy with disappear? It’s common to frame discussions of societal transitions by focusing on the new skills… [new statues… the new becoming essential]. But instead of looking at [the new}… perhaps we should consider the obverse: what becomes safe to forget? Protesters gathered in Emancipation Park Saturday morning, August 12, 2017 in anticipation of a noon rally to be held by “Unite the Right” in protest of the projected removal of a statue from Lee Park honoring Confederate Gen. Robert E. Lee. Members of Unite the Right, by and large white nationalists, are met by a group of counter-protesters in Charlottesville, Virginia, Aug. 12, 2017. Later on the same day, a car driven by a member of the alt-right plowed into a group of counter-protesters. A 32-year-old woman crossing at an intersection was struck and killed, and the suspected driver was arrested. Instead of coming to blows the question that the marchers and counter-marchers ought to have been addressing, without violence, was should the statue of Lee be removed? And how should the past, in the form of monuments, and yes ideas, and in this instance statues, be protected and preserved? I’m pretty sure that Orwell’s words were not at all in the minds of the counter-protesters, the Antifa or anti-fascists, or in the minds of the white supremacist members of Unite the Right, those who were defending the Lee statue. While the counter protesters may have been looking to clean house in the South, doing away with some of the worst parts of our history, in particular slavery and the monuments to the murderous war between the states, they were certainly not looking to do away with the past, they couldn’t, only some parts of that past. But when you think about it, about cleansing the past of some of the terrible things some of us really don’t want to remember, there is really no end to the process. Once you start it’s likely that the process won’t be stopped. Might it not be better to keep the past, in this instance the statue of Robert E. Lee in Lee Park in Charlottesville? For who among us do not have things that we would rather make disappear, such as in this case when the Antifa would make the statue of Robert E Lee disappear? Yes the South was mistaken and has been and is still being corrected. But who among us has not made mistakes, terrible mistakes in some instances, but the mistakes of the ones are not the mistakes of the others, and by allowing the statues, memorials for many of us to an ugly past, to remain aren’t we doing what we should be doing, allowing the past to remain and history to be? Without the defending the white supremacists, and without defending the Antifa or anti-fascists there is, it seems to me, a legitimate difference of opinion in respect to what should be done, if anything, with General Lee’s statue in the Robert E Lee Park in Jacksonville, Virginia, also the home of the Thomas Jefferson’s University of Virginia. Probably what should have happened is something other than what happened in Orwell’s 1984, and is still happening in today’s world where ISIS members are gleefully destroying the antiquities of past civilizations that they no longer accept let alone believe in. But in both instances, in the antebellum South and in Dur Sharrukin, a former capital of the Assyrian empire in Nineveh that dates back to the 8th century BC, the pasts are real, involved thousands of people. Shouldn’t both pasts be preserved, and no matter how terrible they may have been for the lives of many who were there and lived through them shouldn’t we remember them, not forget they ever occurred? What we choose to remember, and not to remember, demands a certain kind of wisdom that we no longer seem to have in great abundance. And if there had been wisdom present that day on August 12 in Charlottesville, what did happen may never have happened. So as with so many things that are happening today we need wise leadership, and instead we have Donald Trump who about Charlottesville, did say there was blame and there were good people on both sides. Regarding what of the past should be defended, what should be if not treasured held on to, he had nothing to say. So without presidential leadership Charlottesville has become whatever the various opposing sides what it to be. And it continues, the attempt to have the past live up to our notions of virtue. 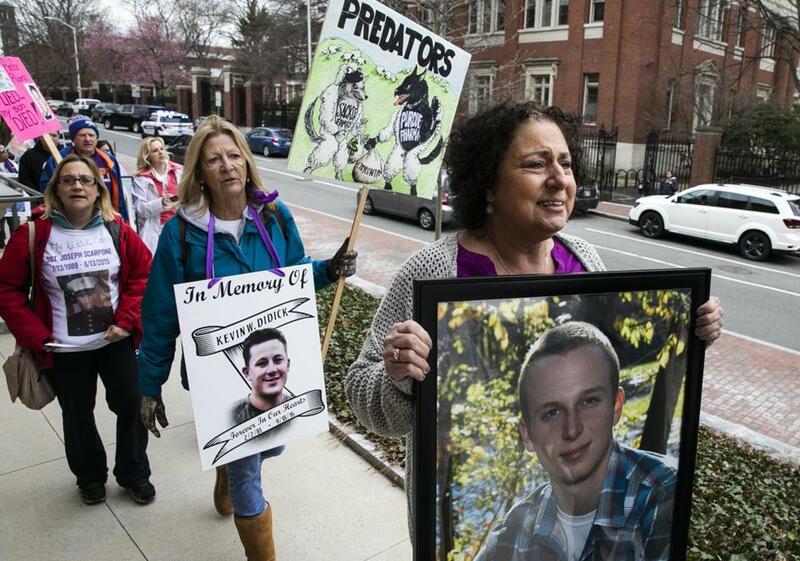 Read this from the Boston Globe this morning: –Parents and supporters of children lost to opioid epidemic urge Harvard to change name of Sackler museum. Early Friday morning they marched in front of the Arthur M. Sackler Museum and the Fogg Museum early Friday afternoon, holding photos of their children. Trump declares ‘country is full,’ says US can no longer accept illegal immigrants. But is it full? NOT SO! !When was the last time you traveled from New York to California, by train or by car and must have remarked the emptiness of our country? “The United States is not remotely close to being full. Far from running out of room for more people, most of this immense country is wide open and empty. [While] nearly two-thirds of the US population live in cities — those cities take up just 3.5 percent of the nation’s land area. Add in all the other places where Americans live — villages, islands, farms — and the land area still amounts to a mere sliver of US territory… some 7 percent of the total. The country, in other words, isn’t 100 percent full, it is 93 percent empty. The nation’s most populous city, of course, is Trump’s hometown of New York, with 8.5 million residents and a population density of 28,000 people per square mile. Life in the Big Apple may not be for everyone, but countless Americans wouldn’t dream of living anywhere else. Suppose, says Abbamonte, that all Americans lived at the same population density that New Yorkers do. He did the math: At 28,000 people per square mile, the nation’s entire population would “fit comfortably in the combined area of Delaware and Maryland.” At the even greater population density of Manhattan alone — 72,000 people per square mile — “the entire population of the United States, Puerto Rico, and other US territories could reside in the tiny State of Connecticut….Too many people? In many parts of this country, the problem is exactly the opposite. Population growth in the United States is at its lowest level since the 1930s, … America isn’t overloaded with too many people; if anything, it needs a lot more of them. Wasn’t it Angela Merkel who wanted to open Germany’s doors to more than a million refugees, thereby defining her legacy, a landmark moment in her career. Would that there were among our own leaders just one with that kind of humanity and courage. Instead we have a slew, most of them Republicans, of self-seeking and servile flatterers of Donald Trump. Now the people we need are right here, at the Southern border, coming here by the thousands (that which frightens the white supremacist Donald Trump and his whisperer, Stephen Miller). They’re coming to us for asylum having fled for excellent reasons the lawless countries of the Northern Triangle, Hondurus, El Salvador, and Guatemala. They say they want to come in. That they want to join us. We ought to be opening our borders and welcoming them to our country. We’ve got plenty of room for their thousands and more. One can live by dogma or by discovery. Dogmas (from the Greek for received opinions that “seem good”) may seek to unify people (as is the implied intent of religious dogma, religio being Latin for “binding together”) but insofar as a dogma must be taken on faith it winds up bifurcating humanity into a faithful us and a suspect other. Scientific discovery might have divided the world, but instead has found that all human beings are kin—to one another and to all other living things—in a universe where stars and starfish alike obey the same physical laws. So as humans move from dogma toward discovery, we increasingly find ourselves inhabiting one world. Speaking Truth to Power, Two among the Republican candidates who do. NBC News , April 7 In an exclusive interview with Meet the Press, South Bend Mayor Pete Buttigieg (D-Ind.) talks to Chuck Todd about his 2020 presidential bid and why he believes Democrats are looking for generational change. You said something rather strong about the president, that you said, “It’s hard to look at his actions and believe that they are the actions of somebody who believes in God.” How do you square that assessment with the fact that the Evangelical Christian community is so devoted to his candidacy? Well, it’s something that really frustrates me because the hypocrisy is unbelievable. Here, you have somebody who not only acts in a way that is not consistent with anything that I hear in scripture or in church, where it’s about lifting up the least among us and taking care of strangers, which is another word for immigrants. And making sure that you’re focusing your effort on the poor. But also personally, how you’re supposed to conduct yourself. Not chest thumping look-at-me-ism, but humbling yourself before others. Foot washing is one of the central images in the New Testament. And we see the diametric opposite of that in this presidency. I think there was perhaps a cynical process where he decided to, for example, begin to pretend to be pro-life and govern accordingly. Which was good enough to bring many Evangelicals over to his side. But even on the version of Christianity that you hear from the religious right, which is about sexual ethics, I can’t believe that somebody who was caught writing hush money checks to adult film actresses is somebody they should be lifting up as the kind of person you want to be leading this nation. You grew up in arguably the most famous Catholic town in the country. I’m curious on abortion. I know what your position is, but how do you have a conversation about it? You’re in a community that is extraordinarily divided on this. On this issue. You have pro-life Democrats that don’t necessarily get courted nationally anymore. How do you square that? And what is your definition? When does life begin and is there any role for government in abortion? So as someone who’s pro-choice but who has many friends and even supporters who view this issue very differently than I do, I think it begins by having some measure of good faith. And understanding that people arrive at their convictions on this often from a deeply felt and sincerely held place. But in my view, this is a question that is almost unknowable. This is a moral question that’s not going to be settled by science. And so the best way for it to be settled in practice is by the person who actually faces the choice. And when a woman is facing this decision in her life, I think in terms of somebody besides her who can most be useful in that, the answer to that would be a doctor. Not a male government official imposing his interpretation of his religion. All right. And the final question I want to ask you about: the Second Amendment. You come from a Second Amendment state, some might argue, whatever that means to folks. Do you think the Second Amendment, as it’s written, prevents gun control the way the Supreme Court says it does? I don’t think it has to because we’ve already decided within the framework of the Second Amendment that we’re going to draw a line somewhere, right? “Shall not be infringed” clearly doesn’t mean that you’re entitled to a nuclear weapon. I mean, somewhere in between a slingshot and a nuclear weapon, we’re going to draw a line about what makes sense. In the same way that my right to free speech doesn’t include yelling “Fire” in a crowded theater, in the same way that, as one Supreme Court justice said, “My right to swing my fist ends where somebody else’s nose begins.” There are common sense limits that a thinking society can live by, while making sure that we honor the lifestyle of sporting, which is where so many family bonds are created. And they’re just a deep part of our tradition. And the idea that people should be equipped to defend themselves if they need to. Unfortunately, I have to leave it there. But Pete Buttigieg, thanks for being on. Stay safe on the trail and I look forward to asking you more questions…. “You could either be openly gay or run for office, but not both,” Buttigieg recalled of his early days in politics. But he said he was uncomfortable with the idea of coming to terms with his sexuality as a young man, saying he “would have done anything to not be gay, when I started to half way realize what it meant that I felt the way I did,” comparing it to a war inside himself. “If you had offered me a pill to make me straight, I would have swallowed it before I could get a sip of water,” he said. In previewing his plans for a potential presidency, the mayor said he would push for a Federal Equality Act immediately upon entering office…. He said he would also push to overturn President Trump’s ban on transgender service members in the military. “The struggle is not over when transgender troops have their careers threatened with ruin one tweet at a time by a commander-in-chief who he himself pretended to be disabled in order to get out of serving when it was his turn,” he said, referring to Mr. Trump’s deferments over bone spurs during the Vietnam War. IOWA CITY, April 7 2019 — Former Texas Democratic Rep. Beto O’Rourke offered sweeping criticism of Israeli Prime Minister Benjamin Netanyahu on Sunday, outright calling him “racist” and an obstacle to peace. Could Joe Biden and Stacey Abrams Form an Early Dream Ticket for 2020? Sometimes political observers add two and two and get five. 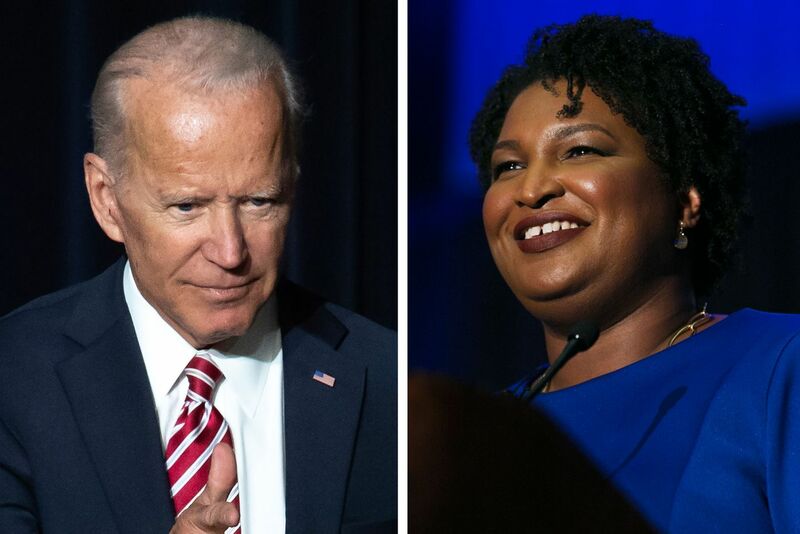 That could be happening with sudden speculation that Joe Biden and Stacey Abrams might form an early presidential–vice-presidential ticket. Biden did privately meet with Abrams recently. And Biden’s staff has publicly kicked around the idea of their guy shaking things up by (among other things) choosing an early running mate. There’s no particular evidence that the one thing is related to the other. But for the sake of argument, let’s look at the idea and see if it makes any sense for either politician. When Team Biden first raised the early-ticket idea a year ago, I was skeptical. This is something no major candidate has actually tried. There’s probably a good reason for that. Setting up a ticket from the get-go, unless it’s just a dazzling no-brainer, is mostly an attention-getting device, and again, Joe Biden doesn’t need that. And it sacrifices the tactical flexibility that can be useful to a putative nominee seeking to unify the party and send a distinct message to the general electorate. If the idea is simply that Biden needs a running mate to counter his age or his ultimate-Washingtonian image, he can make it known he’s inclined to that direction without naming names, and potentially giving himself a dual problem. The age issue means that any Biden running mate will be examined more closely than the usual veep because she or he will be more likely — actuarially — to get the big job than the usual veep. And dumping a veep choice during the campaign itself would be a catastrophe, as the late George McGovern proved. It’s telling that the only two early running-mate announcements in living memory were by desperate candidates looking for a half-court hook shot at the buzzer: Ronald Reagan in 1976, whose startling choice of moderate Senator Richard Schweiker was designed to shake loose some delegates in Pennsylvania; and Ted Cruz in 2016, who announced Carly Fiorina as a prospective veep only after he had been mathematically eliminated from the nominating contest. Desperation is not a good look for Joe Biden. What’s happened since then is that Biden has been subjected to a barrage of criticism about his record on racially sensitive issues, from his anti-busing activism in the 1970s to his key role in the passage of anti-crime legislation in the 1990s associated with mass incarceration. This line of attack has endangered a key Biden political asset: his popularity among African-American voters, mostly attributable to his two-term partnership with Barack Obama. Biden’s already vulnerable to a loss of black support with two African-American rivals (Kamala Harris and Cory Booker) in the field. So without question, being closely associated with a celebrity African-American pol would be helpful, if not necessarily a silver bullet. But would this sort of partnership with Biden make any sense for Stacey Abrams, who at present is among the most widely admired Democratic politicians in the country? Why would she want to take sides in what could become a fractious 2020 nominating contest, unless she decides to run for president herself (as she has hinted is still a possibility)? Ironically, the key reason she might entertain an early Biden–Abrams ticket is that it would get her off the hook of being incessantly pressured to run for the Senate in Georgia in 2020 — a job she’s sensibly never shown any interest in (she definitely wants to be governor of Georgia, and perhaps president). If Biden loses the nomination or the general election, she can still return to Georgia and run for governor in 2022. And if he wins, well, she’d be at least as well-positioned to run for president herself as Biden is today, and the opportunity might come up in 2024, given Biden’s age. Abrams is only 45. Going from being a former state legislator to the putative vice-president on a ticket with one of the two most likely nominees might seem a reasonable path forward for her, particularly if she believes her presence could give Biden a crucial boost. Serving as the protector of Biden’s racial flank, on the other hand, might get a little old and a little limiting for someone of Abrams’s enormous talents and potential. In the end, Biden may not go in this direction (or even run for president, for that matter), and Abrams might not even be interested in it. But until one or the other of them rules it out, the speculation will continue. It really is hard to imagine a better tonic for the things that politically ail Uncle Joe than having Stacey Abrams at his side on the tough road ahead. The kind of “fake news” that our president would rather not hear. Why is President Trump defending MBS? Ok it’s for the cash infusions that the Saudis represent for Trump and for the Trump properties in the Middle East and elsewhere. The very best that Trump seems to come up with, to defend his friend, Mohammed bin Salman, is to play the national security card (Khashoggi’s op eds for the Washington Post and other publications supposedly putting the Saudi nation at risk). This is what joins our president to MBS, a lie. According to both of them the security of both countries is threatened, —in the US by refugee caravans, and in SA by “fake news,” that is real news, by real journalists such as Jamal Khashoggi, and the writers of the article below. Once again Trump is playing the national security card, the very same one he’s been using to secure funding for his wall, his wall because the country is in no need of a wall on the Southern border, doesn’t want one. The people have said in a large majority that they don’t want it. WASHINGTON — Crown Prince Mohammed bin Salman of Saudi Arabia authorized a secret campaign to silence dissenters — which included the surveillance, kidnapping, detention and torture of Saudi citizens — over a year before the killing of Jamal Khashoggi, according to American officials who have read classified intelligence reports about the campaign. The rapid intervention team had been so busy that last June its leader asked a top adviser to Prince Mohammed whether the crown prince would give the team bonuses for Eid al-Fitr, the holiday marking the end of Ramadan, according to American officials familiar with the intelligence reports. Saudi laws prohibit torture and hold accountable those involved in such abuses of power, the spokesman said, and judges cannot accept confessions obtained under duress. The kingdom’s public prosecutor and the Saudi Human Rights Commission are investigating “recent allegations,” he said. The Saudi government insists that the killing of Mr. Khashoggi — a dissident journalist living in the United States who wrote for The Washington Post — was not an assassination ordered from Riyadh. The decision to kill him was made by the team on the spot, government officials say, and those responsible are being prosecuted. Turkey and American intelligence agencies say the killing was premeditated. The kingdom says that 11 Saudis are facing criminal charges for the killing and that prosecutors are seeking the death penalty for five of them, but officials have not publicly identified the accused. After the killing of Mr. Khashoggi, Saudi officials acknowledged that the Saudi intelligence service had a standing order to bring dissidents home. What they did not acknowledge was that a specific team had been built to do it. Saudi officials declined to confirm or deny that such a team existed, or answer questions about its work. Saudi Arabia has a history of going after dissidents and other Saudi citizens abroad, but the crackdown escalated sharply after Prince Mohammed was elevated to crown prince in 2017, a period when he was moving quickly to consolidate power. He pushed aside Prince Mohammed bin Nayef, who oversaw the security services, giving the young prince sway over the intelligence agencies. Mr. Khashoggi was killed inside the Saudi Consulate in Istanbul and dismembered with a bone saw. Turkey used surveillance video and audio recordings to uncover the crime, identify the team that carried it out and leak their names and photos to the news media. Mr. Riedel said the team’s sloppiness showed that it was used to operating freely inside the kingdom and not under the watchful eye of an adversary’s intelligence service. The Rapid Intervention Group was authorized by Prince Mohammed and overseen by Saud al-Qahtani, a top aide whose official job was media czar at the royal court, American officials said. His deputy, Maher Abdulaziz Mutreb, an intelligence officer who has traveled abroad with the crown prince, led the team in the field. Another operative on the team was Thaar Ghaleb al-Harbi, a member of the royal guard who was promoted in 2017 for valor during an attack on a palace of Prince Mohammed’s. Mr. Mutreb and Mr. al-Harbi are on trial in Riyadh for charges connected to Mr. Khashoggi’s death, a Saudi official said, while Mr. Qahtani is under house arrest, has been banned from travel and is under investigation, making it unclear whether the team is still operating. American intelligence reports did not specify how involved Prince Mohammed was with the group’s work, but said that the operatives saw Mr. al-Qahtani as a “conduit” to the prince. When Prince Mohammed locked hundreds of princes, businessmen and former officials in the Riyadh Ritz-Carlton in 2017 on accusations of corruption, Mr. al-Qahtani and Mr. Mutreb worked in the hotel, helping pressure detainees to sign over assets, according to associates of detainees who saw them. Many of those detained at the Ritz were subject to physical abuse, and one died in custody, according to witnesses. It is not known whether members of the rapid intervention team were involved in the abuse. The Saudi government has denied that any physical abuse took place there. But it was only after Mr. Khashoggi’s killing that the extent of the team’s work began to emerge. Mr. Mutreb and Mr. al-Harbi were both in the consulate when Mr. Khashoggi was killed, according to Turkish officials. American intelligence about the team’s previous operations informed the assessment by the C.I.A. in November that Prince Mohammed had ordered Mr. Khashoggi’s killing, United States officials said. The C.I.A. declined to comment. United States intelligence agencies do not appear to have conclusive proof that Prince Mohammed ordering the killing, but they have pieced together a pattern of similar operations carried out by Saudi operatives under the prince’s authority. The agencies continue to gather evidence about Prince Mohammed’s role in the operations, and in December the National Security Agency produced a report saying that in 2017, the prince told a top aide that he would use “a bullet” on Mr. Khashoggi if he did not return to the kingdom and end his criticism of the government. Intelligence analysts concluded that Prince Mohammed may have not spoken literally — that he was not ordering Mr. Khashoggi to be shot — but that he intended to silence the journalist by killing him if the circumstances required it. The C.I.A. assessment has created tension between American spy agencies and President Trump, who has made warm relations with the Saudis a cornerstone of his foreign policy. The crown prince has been a close ally of the Trump White House, especially Jared Kushner, the president’s son-in-law and senior adviser. Despite the C.I.A.’s assessment that Prince Mohammed ordered the operation, Mr. Trump has said repeatedly that the evidence was not conclusive. The grisly killing of Mr. Khashoggi led to a storm of outrage in foreign capitals and a new scrutiny of the powerful crown prince, who had billed himself as a forward-thinking reformer with a grand vision to modernize the kingdom. But the journalist’s killing was just the latest in a string of clandestine operations against less high-profile Saudis, including members of the royal family. American intelligence officials said that some of those detained in these operations were held at secret locations, including opulent palaces used by King Salman and his son, until November 2017, when many were moved to the compound surrounding the Riyadh Ritz-Carlton. At the time, the hotel was being used as a five-star jail in the kingdom’s anti-corruption campaign. That crackdown became a cover for clandestine operations against Saudi dissidents, who were moved into detention in the Ritz at that time, according to American officials. The Rapid Intervention Group also appears to have been involved in the detention and abuse of about a dozen women’s rights activists, who were detained last spring and summer. The activists, who had campaigned for lifting the kingdom’s ban on driving by women, included several well-known figures: Loujain al-Hathloul, who had been jailed for trying to drive her car into the kingdom from the United Arab Emirates; Aziza al-Yousef, a retired computer science professor; and Eman al-Nafjan, the linguistics lecturer. The treatment was so harsh that Ms. al-Nafhan tried to commit suicide, according to a United States intelligence assessment. Their trial opened in Riyadh on Wednesday, but journalists and diplomats were not permitted to attend, and the government did not announce the charges against them. In the kingdom’s effort to forcibly repatriate Saudi citizens living abroad, it was not always clear which operations were carried out by the rapid intervention team and which by other parts of the security services. At least one Saudi who was detained in the Ritz and accused of corruption, Rami al-Naimi, a son of a former Saudi oil minister, was forcibly repatriated from the United Arab Emirates in November 2017. An associate of a senior member of the royal family, Faisal al-Jarba, was snatched in a midnight raid on an apartment in Jordan last June and returned to Saudi Arabia. His family has struggled to get information on where he is or why he is being held. In August 2017, a minor prince, Saud bin al-Muntasir bin Saud, was sent back to the kingdom from Morocco. Last May, a university student who had dual Saudi-Qatari citizenship was arrested during a visit to Kuwait and sent home…. Mark Mazzetti reported from Washington, and Ben Hubbard from Beirut, Lebanon. The Neanderthals and Denisovans — both relatives of modern humans — were roommates, literally, for thousands of years in a remote Siberian cave. Back in ancient times, this cave would have been a real estate agent’s paradise. It’s the only place in the world that Neanderthals, Denisovans and possibly even modern humans lived together throughout history, almost continuously over both warm and cold periods during the past 300,000 years. By analyzing fossils and DNA, the researchers learned that the enigmatic Denisovans lived in the cave from at least 200,000 to 50,000 years ago, and the Neanderthals lived there between 190,000 and 100,000 years ago. These Denisovans and Neanderthals are estimated to have separated from the lineage that would become Homo sapiens approximately 600,000 to 744,000 years ago and significantly diverged from each other genetically about 200,000 years later. We face literally existential threat to life itself, we have elected a president who denies anything is happening at all, and is, in fact, determined to accelerate the collapse. I don’t know how this paradigm affects you every day, but it is for me the gutting context for everything, a growing nausea laced with guilt and shame. In a century, we will have destroyed this Earth as we have known it — in absolutely full awareness of what we are doing. It’s the greatest crime humanity has ever committed. It distresses and enrages me particularly that one core bloc egging on this devastation are Evangelical Christians, utterly indifferent to God’s creation, indeed, actively hostile to it. How, I wonder, can they be this way? In a statement, Sarah Sanders said Trump would sign a funding bill to avert another government shutdown and also take other executive action—including declaring a national emergency—to ensure we stop the national security and humanitarian crisis at the border. According to Sanders, February 14, 2019, Trump is once again delivering on his promise to build the wall, protect the border, and secure our great country. Jill Lepore. A New Americanism. What is the America as in MAGA…or “Make America Great Again”? When we go back to find the greatness in our past, how do we know when we’ve got there, where and when to stop? With the arrival of Columbus on the shores of the new world, with the Founding Fathers, with the freeing of the slaves? You see what I mean. Greatness is to be found whenever and wherever men have lived (and even before men in the Age of the Great Apes, and before that in the Age of the Dinosaurs). But Donald Trump and his MEGA cap wearing followers at the rallies seem to be completely ignorant of both America and the meaning of Great, or Greatness. If you read my blogs you’ll know I like the website Quora, that I like Quora a lot. And probably like most of the Quora subscribers, in particular like those who answer the Quora questions, as Jonathan Hall below, I like to read about things, learn about things, fill in a few of the myriad holes in my own meager knowledge of the past. Quora helps, more than school ever did. Exsqueeze me? It really is a pity that even today, despite all the literature, museums and outreach, even the average citizen of the eastern United States is still blissfully unaware of the complex societies whose remnants they often walk or drive right over. The Eastern Woodlands of the United States has been a nexus for stratified civilization since 3500 B.C. The Mississippi River area was even home to its own independent cradle of agriculture known as the Eastern Agricultural Complex, from which we still have popular vegetables like squash and sunflower. The peoples that farmed these crops have been traditionally termed the “Mound Builders”, so named for their apparent proclivity towards earthworks. The term is a bit dated now, and archaeologists today are able to differentiate specific cultures, but “mound-building peoples” is often still used to describe the cultures in general. Starting around 100 BC, sites all around the Mississippi start adopting a similar set of traits such as pottery styles, arrowhead techniques and artistic motifs, along with a much more pronounced sense of social stratification. The Hopewell appear to have begun with the Ohio Hopewell, which built upon the stratified Adena culture that existed since 1000 BC on the Ohio River valley, which connects to the Mississippi. The Hopewell greatly proliferate the number of mounds constructed in the Eastern Woodlands and diversify their uses. One of the most iconic examples of the Hopewell are the Newark Earthworks: a series of interconnected circles, walls and moats that appear to serve as a massive lunar observatory. The Moon’s orbit ‘wobbles’ in relation to the Earth: at one extreme the orbit is rotated one way, and rotated the other way at the other extreme. The point in this cycle where the Moon’s orbital plane reaches its northernmost or southernmost extent before going back to the other is termed the lunar standstill, which produces an effect not unlike the Sun’s solstices. This happens every 18 years, 7 months and almost 10 days. The Newark Earthworks are able to track the Moon’s declination until the next standstill with remarkable precision. Newark today. A country club still owns parts of the earthworks. It’s possible that the Ohio Hopewell had such influence over the Eastern Woodlands that they may have started a new religious movement, or perhaps their influence was economical and assimilating their culture was better for business, or people may have simply admired parts of their culture enough to replicate it. A mix of the three may have happened, but we might never know specifically why people wanted to copy them. In the year 500, the bow and arrow trickled southward after being introduced by the Inuit from northern Canada. This makes hunting (and fighting) much more accessible, freeing people up from their dependencies on crops and some hierarchical control. From there the magic begins to die for the Hopewell and the societies within its sphere fall into the geographically broader-ranging Woodland period. The 500 years of the Late Woodland period saw a great intensity in fortification, a significant reduction in mound-building (though some are still built) and more numerous, smaller walled villages instead of the larger towns of the Middle Woodland’s Hopewell. This lifestyle, in some form, actually lasted in the periphery of the Eastern Woodlands until the arrival of Europeans. By the year 1000, however, something new appears in the heart of the Mississippi. People are once again gathering in large towns and forming wealthy elites under the control of powerful rulers who began using earthworks to proclaim their legitimacy. Corn (maize) was introduced to the Eastern Woodlands in 200 BC, but had a hard time dealing with the colder climates. However, new cold-hardy cultivars had finally been developed and were taking the Eastern Woodlands by storm into a new agricultural revolution. Things were about to get corny. The “Sponemann Figurine” from Cahokia. The headwrap seen on her head has been documented in historical Native American tribes. Copper plate of a falcon-eyed man from Spiro Mounds, Oklahoma. Wood duck effigy bowl, diorite. Moundville, Alabama. But one of the most profound examples of Mississippian culture, and what everybody wants to see when they visit the sites, are of course the mounds. Hello, This is a tooth (although it doesn’t look like one). It’s just one tooth, but it tells us about the sloth. Imagine your own teeth one day, some 27,000 or more years from now when homo sapiens has gone extinct, and your teeth are found and are in the hands of a scientist of the time, whoever or whatever that person or robot might be, and who will have replaced us as the highest form of life on earth. What would our teeth tell “him” about how we lived when it was our turn to be living on the earth? Not being a dentist, nor a paleontologist, nor not knowing anything at all about the time 27,000 years from now when our teeth may be found by a paleontologist, I have no idea. but did not survive the advent of homo sapiens about 11.000 years ago. But let me get back to the single tooth and what it tells us. It’s kind of unbelievable what we can learn from a sloth’s tooth, at least just so far if we know how and where to look, about the life secrets of a single animal. Grass, shrubs and dryness: a year in the life of a giant sloth. But why am I writing about the giant sloth? Well I’ve just been watching Michael Cohen being brutally and unfairly attacked by the Republican members of the House Intelligence Committee, and I desperately wanted to walk away and immerse myself in something real. The work of scientists is real, the work of the representatives in Washington DC is not. Our president has not yet understood this, about Washington and about science. But here is a little of what the scientists have learned about this fabulous (and lazy?) animal who did survive the last Ice Age. Will we survive the present age of the Great Warming? Analysis of the tooth, prised from a clay ledge metres below the surface of a water-filled sink-hole in central Belize, reveals details about what the sloth ate, and the climate it lived in. Jean Larmon from the University of Illinois at Urbana-Champaign, US, and colleagues measured the amounts of specific chemical elements that were incorporated into the tooth when the sloth was alive. The isotopes carbon-13 and oxygen-18 are particularly useful. Carbon-13 values can tell scientists about the types of food the sloth consumed, and oxygen-18 levels reveal the aridity of the climate at the time. Because amounts of these isotopes slowly change, or decay, over time, they can also reveal the age of any object containing them….In other animals, the hard outer coating of teeth – the enamel – is usually used in stable isotope analysis. But sloth teeth grow continuously – much like a rat’s incisors – and therefore lack it. Larmon and colleagues instead took readings from different layers of the sloth tooth. The values varied. Using a technique that measures the amount of light emitted by a fossil, they ascertained that the most reliable values were from a hard layer called orthodentin. By sampling along the length of this layer the team built up a picture of the sloth’s life over a period of about a year. The animal lived smack in the middle of the last glacial maximum, the most recent time during the Last Glacial Period when ice sheets were at their greatest extent, well before humans arrived in the Americas. At the time, Central America wasn’t covered in tropical forests as it is today. The region was much drier, covered in savannah and juniper scrub vegetation. The sloth experienced two brief wet seasons, separated by a long dry season. Its diet changed with the seasons, suggesting it was an opportunistic feeder. This could have held it in good stead for adapting to the increasingly arid conditions of the period. During the wet seasons, it most likely ate grasses and shrubs, but no leafy trees. To understand the biology and the ecology of these animals when they were alive is absolutely critical. Armed with that information, scientists are better able to assess what factors – a changing climate, say, or the arrival of humans – eventually led to the species’ extinction.